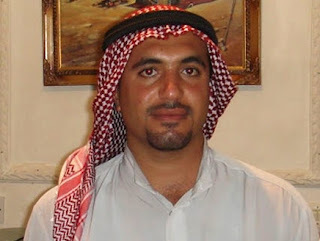 The Iraqi authorities colluded with the Iranian regime in the illegal refoulement of UNHCR-mandated Ahwazi Arab refugee Mohammad Ali Amouri, according to his former cellmate Saleh Hamid. Hamid spent three years in prison with Amouri in Iraq. His allegations come alongside documentary proof that the Iraqi government ignored UNHCR appeals to prevent Amouri's extradition, contrary to international law. He said: "We were in the same section where we underwent torture, repression and suffering, sharing sadness and happiness together. I know he was not affiliated to any Ahwazi political party." However, on Amouri's return to Iran in February 2011, he was arrested and last July was sentenced to death for "enmity with God" and acting against national security. His death sentence was confirmed by the Supreme Court last week. Amouri is a fisheries engineer originally from Ahwaz City who relocated to Khalafabad, where he did some teaching in the local high schools. He graduated from Isfahan University with a degree in aquaculture and natural resources. He was one of the founding editors of the student newspaper Torath (Heritage) and was also an active blogger. He was originally inspired into political activism by the presidency of Mohammad Khatami and had proposed a plan to form a civic institution called Al-Hewar (Dialogue), but permission was denied by the Ministry of the Interior. He was later involved in the Lejnat al-Wefaq (Reconciliation Committee), an Arab political association whose members were allowed to contest elections and won a number of seats in municipal councils, including a majority on Ahwaz City Council, as well as the Ahwaz seat in the Iranian Majlis. However, the organisation was banned by the government and he was forced to flee to Iraq in 2007 with Shahid Shaabani Amouri and Fares Silawi where he was arrested and detained for five years. Although he had refugee status, he was repatriated to Iran and arrested by the authorities. Fares was killed under torture in Iraq. Hamid said: "Mohammad is a well-known civil and cultural activist who organised cultural, science and poetry events and exhibitions. He was helping poor students in Khalafiya city by running free classes and was an effective activist in his city. He was a very respected man because of his good manners and the sacrifices he made for his own people and his nation. "During our initial criminal hearing in Basra [for illegal entry], one of the Iranian Consul staff was at the court with the judge. We saw him come out of the judge's room five minutes before the hearing. We informed the solicitor that our sentences were imposed due to pressure from the Iranian Consulate and the prosecutor was a member of one of the Iranian-affiliated militia."